A major topic of conversation at the Imbolc ritual here in my corner of Ontario is always the weather. Specifically, how cold is it this year compared to last? The bitterness of the cold always affects turnout. Only the die-hard group members turn out for this one. So we tell ourselves as we stand, shivering in circle as snow spirals around us and the cold creeps in slowly through Arctic boots and insulated mittens. But the hope that infused our ancestors at this time also penetrates our multiple layers and that is the whole point of the ritual. The rest of the province may talk about six more weeks of winter, depending on whether Wiarton Willie has seen his shadow; Pagans celebrate the return of the sun and light, longer days, the awakening of the goddess, and the rising power of the god as he grows to maturity. Imbolc has many names, as most pagan rituals do. It can be referred to as Imbolg, Candlemas (the Christianized name), Oilmelc, Lupercalia, Feast of Pan, Brigid’s Day, and more. It is the “Feast of Lights,” a fire festival that celebrates light rather than heat. What this means is that it originated in a climate that is 30-days ahead of where more northern climates are, a region where farmers look forward to planting crops and lambs being born, while we’re still hunkered down and hibernating. For some pagans, says McQueen, there are complaints about this, as people find it difficult to relate to celebrations that are out of sync with what is happening in the local climate. Wiccans consider Imbolc to be one of their major celebrations, and it is a greater sabbat. The celebrations that fall on the equinoxes and solstices are considered the lesser sabbats. The greater sabbats include Beltane, Lughnasadh, and Samhain as well as Imbolc. Imbolc falls on either February 1st or 2nd, depending on the text referenced or tradition followed. According to D. J. Conway’s Wicca: The Complete Craft, the name Imbolc may have derived from “imb-fholc,” the Celtic word for washing oneself, or “imbolg,” the Celtic word for “in the belly.” The connection to “in the belly” is the birthing of ewes at this time of year. Imbolc is about new beginnings and awakenings, which are the symbolic links to the references to washing oneself and to birthing lambs. It is the first ritual of the calendar year and a time for starting the cycle of the year over again. 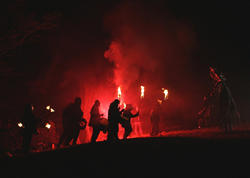 Initiations to the group are common during Imbolc in some Wiccan groups. Brigid is the Celtic fire goddess. The goddess at this time is in her maiden aspect and her fire is the spark of light that transforms, heals, and awakens visions. Light can be incorporated into ritual by burning the greenery that was saved from the previous Yule ritual. The intent is to usher out winter and invite in spring. Spring cleaning, though it might seem early in the year for this, can be done as a way to purify your surroundings, which will have a positive effect psychologically at a time when winter’s harshness still holds thrall in many places. The reward for showing up to an Imbolc ritual is the reminder that we’re not isolated as we get together with friends and loved ones. It also strengthens our connection to nature at a time when some of us are reluctant to venture forth in it. The hot spiced cider and comfort foods at the potluck that follows boost the spirit, and in Canada, it’s another opportunity to talk about the weather, of course. When the Wheel of the Year turns again, winter will succumb to spring, and the next celebration, Ostara, will be much milder.